End of over 20 ( 9 Runs )Delhi Capitals 128/9 Amit Mishra* 8(9)Ishant Sharma 0(0) 19.6Hardik Pandya to Amit Mishra. 1 run, A single to finish the game! A short ball on middle, it is flat-batted down to long on for a single. ALL SMILES IN THE MUMBAI CAMP AS THEY WON BY 40 RUNS! 19.5Hardik Pandya to Amit Mishra. 2 runs, Length and outside off, this is carved over point. They run one and then go for the second. The fielder at third man fires a throw to the keeper who collects it and whips the bails off. An appeal follows and the umpire takes it upstairs. Replays show that the batter is in. 19.4Hardik Pandya to Kagiso Rabada. out, OUT! Pollard makes no mistake this time. Hardik bowls it wide outside off. Rabada throws his bat at it. Hits it decently but does not get the distance. Pollard from long off runs to his right and takes it. 19.3Hardik Pandya to Kagiso Rabada. no run, Slower ball and outside off, Rabada throws his bat at it but only manages an inside edge to the keeper. 19.2Hardik Pandya to Kagiso Rabada. SIX, SIX! Rabada nails this one! Short and on middle, Rabada goes for the pull, this time he connects and it is in the crowd in the mid-wicket stands. However, even 4 more of these won't make a difference. 19.1Hardik Pandya to Kagiso Rabada. no run, Just over the stumps! Back of a length and it is the slower one. Rabada looks to pull but misses. End of over 19 ( 10 Runs )Delhi Capitals 119/8 Kagiso Rabada* 3(4)Amit Mishra 3(6) 18.6Lasith Malinga to Kagiso Rabada. 1 run, In the air... dropped! Pollard is the culprit. He dropped a similar one against Chennai. Rabada dances down the track and is foxed by the slower one. He hits it high up in the air towards mid on. Pollard runs in from long on, gets two hands to it but spills it. A run taken. 50 needed in the last over. 18.5Lasith Malinga to Amit Mishra. 1 run, Slower one outside off, Mishra looks to put bat on ball but the ball goes off the outside edge and on the bounce to the keeper. De Kock fails to collect it cleanly and a run is taken. 18.5Lasith Malinga to Amit Mishra. wide, 1 run, Down the leg side, the batter again tries to flick but misses. Wided. 18.4Lasith Malinga to Amit Mishra. leg byes, 4 runs, FOUR! LEG BYES! Full and down the leg side, the batsman looks to flick but the ball brushes the pads and races to the fine leg fence. 18.3Lasith Malinga to Kagiso Rabada. 1 run, Full and outside off, this is driven through covers for a run. 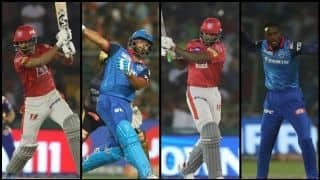 The biggest nemesis of Delhi Capitals this season is proving to be their own home ground of the Feroz Shah Kotla, New Delhi as they succumbed to their third loss at home in four matches, this time to Mumbai Indians, who snapped Delhi’s three-match winning streak on a sluggish track in Match 34 of IPL 2019 on Thursday with a 40-run win, to claim their sixth win. Chasing a total of 169, a formidable one at the Kotla, Delhi were off to a brisk start, but once the ball got old and started to grip the pitch, the free-flowing Delhi batsmen struggled and fell like a pack of cards. While the Mumbai bowlers enjoyed a good day out, it was the 50-run stand off just 26 balls between the Pandya brothers – Hardik Pandya and Krunal Pandya – that eventually proved to the big difference-maker. After opting to bat first, Mumbai were off to a good start with Rohit Sharma and Quinton de Kock adding 57 runs in the powerplay overs, but they soon slumped to 73/3 in 10 and then stuttered to 110/4 by the 16th over. But the Pandyas, more so Hardik, dug in to Delhi’s pacers en route to an power-packed 32 off just 15 balls. Senior Pandya played a crucial knock of 37 not out off 26 balls to take Mumbai to 168/5.